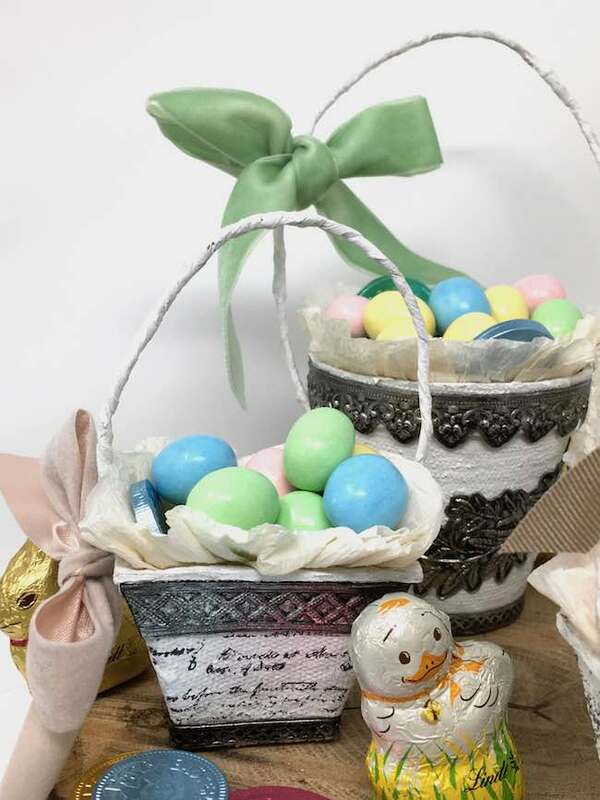 Next in the Spring Craft Series is the Easy Peat Pot Easter Basket. You know, Peat pots – those little pots that you start seeds in each Spring. I’ve seen Easter Baskets made from them for years. 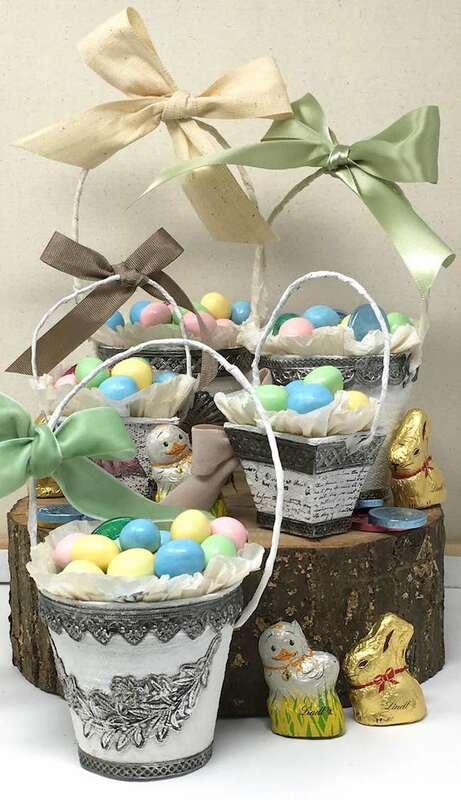 Finally I got inspired to make my own altered version of these Mini Easter Baskets made from peat pots. 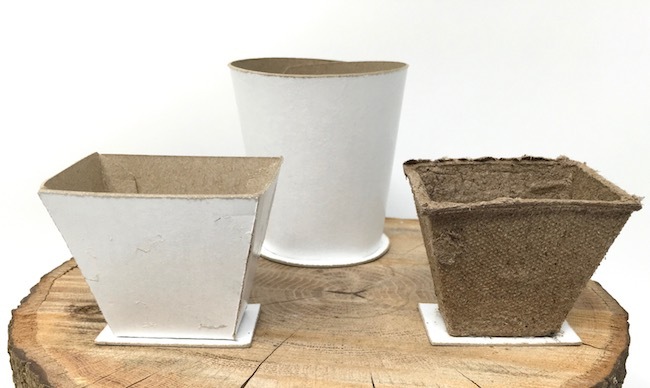 Oh, and if you don’t happen to have any peat pots on hand or you aren’t feeling like going to your local store or garden center or ordering online, I’ve made a pattern that you can download to make your basket shaped like a peat pot. This is an easy DIY Spring craft that you can do in an afternoon. There are so many variations that you can experiment with. Also this craft would make fun wedding favors or table place settings or party favors. Here is my version of the Easy Peat Pot Easter Basket using the Tim Holtz Sizzix Impresslits dies for decoration. 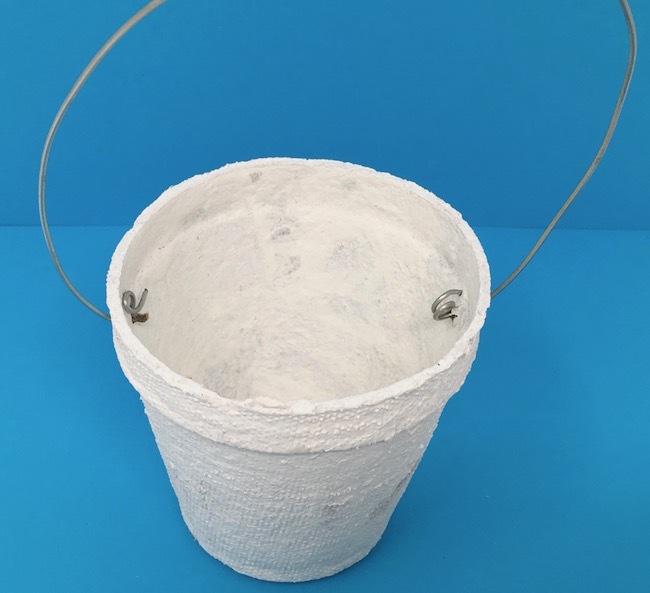 Download the peat pot pattern if you need a pattern to make your basket. There are two things you need to do here. First glue a base onto your peat pot. These little pots are not the most stable containers so it helps to glue a circle or a square to the base to help them stand up better. But I neglected this step in my haste to make the little Easter baskets. You can find the base pattern on the Easy Peat Pot Easter Basket PDF and SVG download in the library. If you are making the little basket from either the SVG or PDF pattern in the Paper Glitter Glue library, just go to the main Paper Glitter Glue library page, click the blue link in the middle of the page which will take you to the password-protected part of the library. There you type in the password. If you don’t have the password, just subscribe to my newsletter below and you will immediately get the password. To make the basket, just glue the tabs together on the rectangular basket or glue the side on the circular basket. You can enlarge the patterns if you like. After you have glued the base on your peat pot, paint it with gesso. The peat material will absorb a fair amount of paint. Gesso is a great primer for this step. As a simple variation to use with the gesso, you can stamp on the smaller rectangular peat pots. Just use a flexible stamp, ink it, and apply it to the side. Hold your stamp tight to the peat pot and then rub the stamp with the other hand to get the stamped image on the pot. 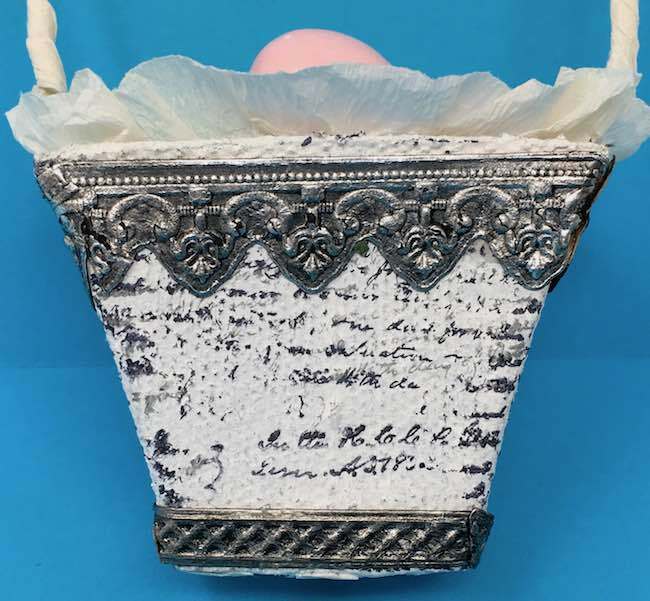 Below you see a word stamp on one of the mini Peat Pot Easter baskets. The stamp that worked the best is the word stamp from the Tim Holtz Stamper’s Anonymous Entymology stamp set. And if you want to paint your baskets a different color, paint them now. For this monochromatic design, I just went with white. You have so many options to decorate your little basket. 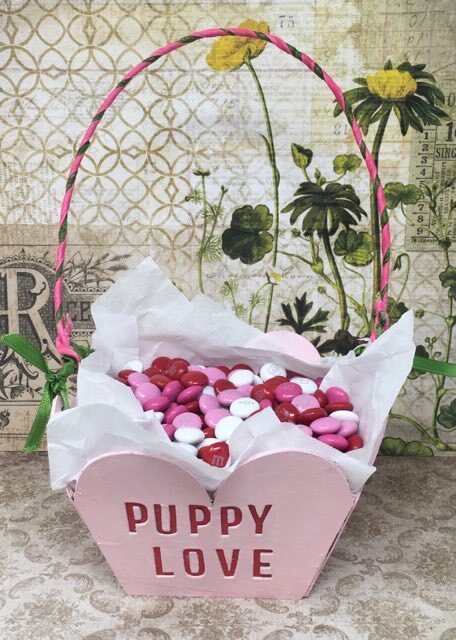 I’ll go over what I did to make these cute little candy baskets for Easter or Spring. To really spruce up my little basket, I gathered crepe paper to make ruffles around the edge of each basket. It’s pretty easy to make the crepe paper festooning (that’s what it is called “festooning”. Kind of cool word). 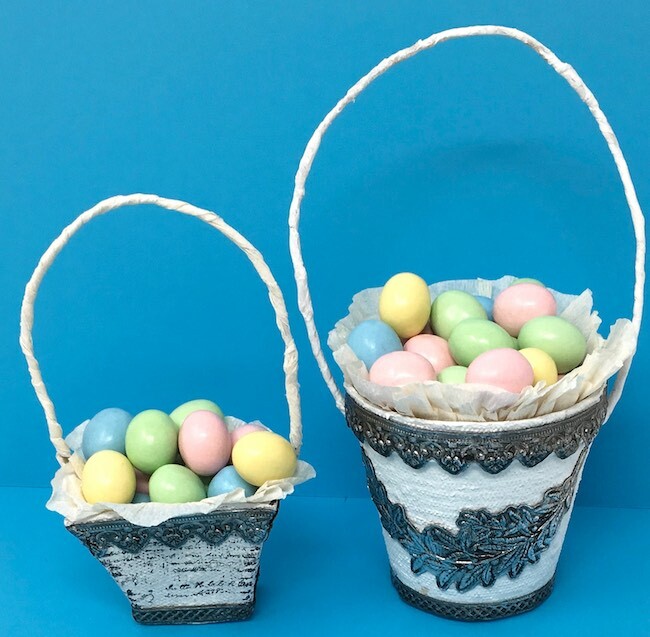 For my first attempt at making little Easter baskets, I used my heavy duty fancy crepe paper, but I found it was too stiff for the simple edging on these little baskets. My next attempt worked better. All you do is sew two layers of crepe paper streamers together with the longest stitch on your sewing machine. Or you can stitch by hand. Then gently pull on the one thread to gather the crepe paper into a nice ruffle. It took me a couple of tries to get it right. 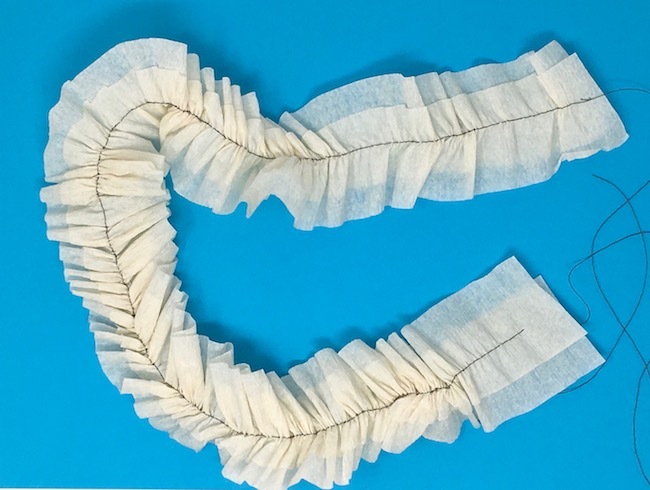 Why use two strips of crepe paper? Because by itself each crepe paper strip is pretty fragile and tears easily. 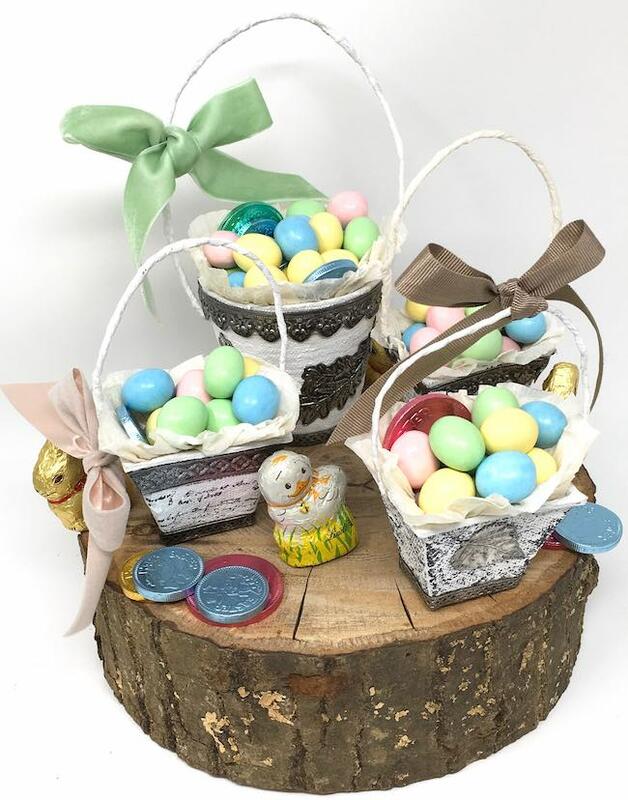 I decided to use some 3-D dies called Impresslits from Tim Holtz and Sizzix to make the decor on my Peat Pot Easter Baskets. Also I decided to go with a monochromatic color scheme for a more sophisticated look. And I want to share my project with the Vintage Journey challenge this month called “Neutral Zone”. So to make the embossed metallic trim I followed the instructions from Tim Holtz. Lightly spritz both sides of the metallic paper with water. Then place the metallic side down on the cutting blade embedded in the Impresslit. Then run it through your die cutting machine THREE times. That ensures the best embossing. 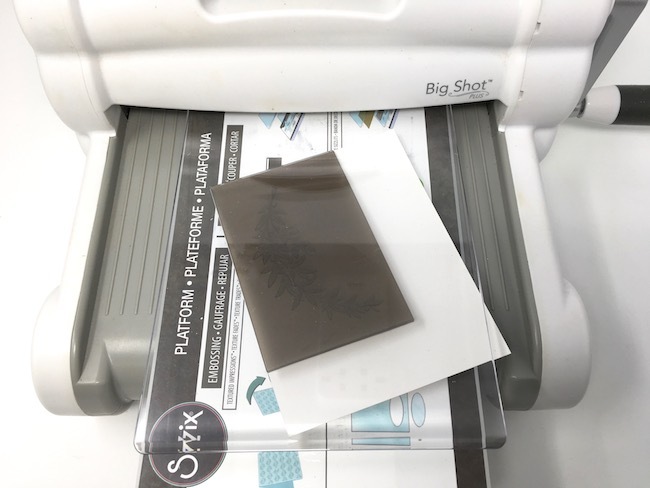 Here’s an important craft tip when using the Sizzix Impresslits 3-D Embossing folders, try to angle your folder on the base so that when it goes through your die cutting machine, it goes through more gradually. Your machine won’t make such a big CLUNK when the folder goes through. To make the embossing really stand out, I painted each piece of trim with Black Soot Distress Paint. Leave it on for a minute or two, then wipe it off with a paper towel. 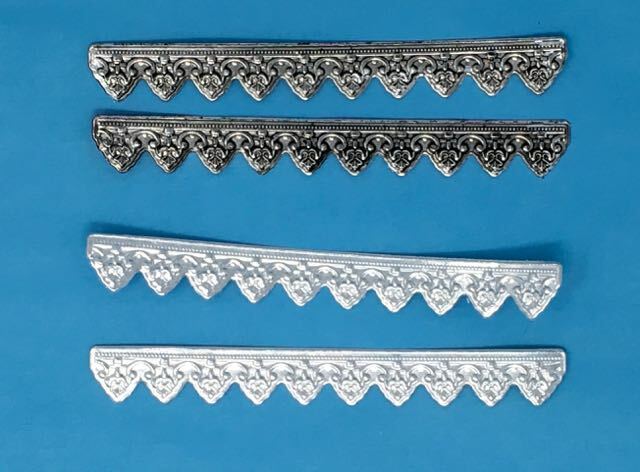 The paint gets in the embossed crevasses and gives great dimension to each piece of trim. The top strips have been painted with black paint which was wiped off after few minutes. The bottom strips are fresh from embossing. This is the Provincial die. 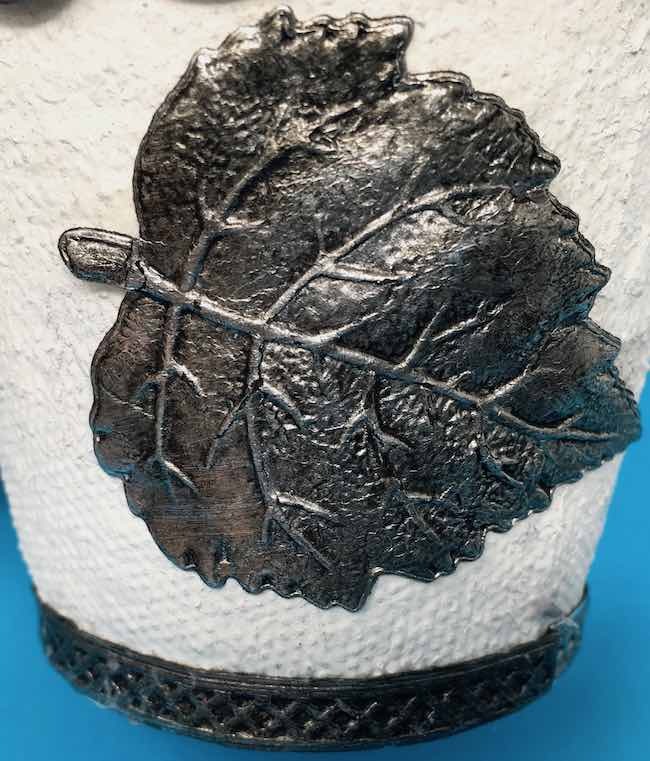 For a more detailed tutorial on using these incredible embossing dies, see these two blog posts – How to Make Dresden trims and How to use the 3-D Impresslits. 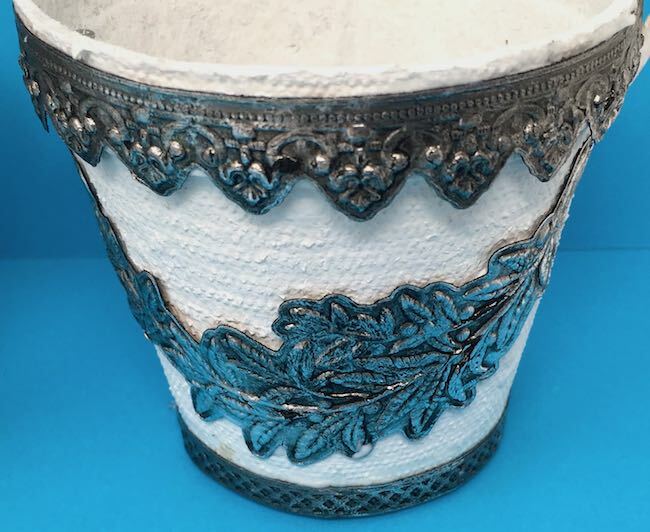 Just look at the incredible embossing detail on the basket trim. Whenever I make a project like this many more ideas flood my head. 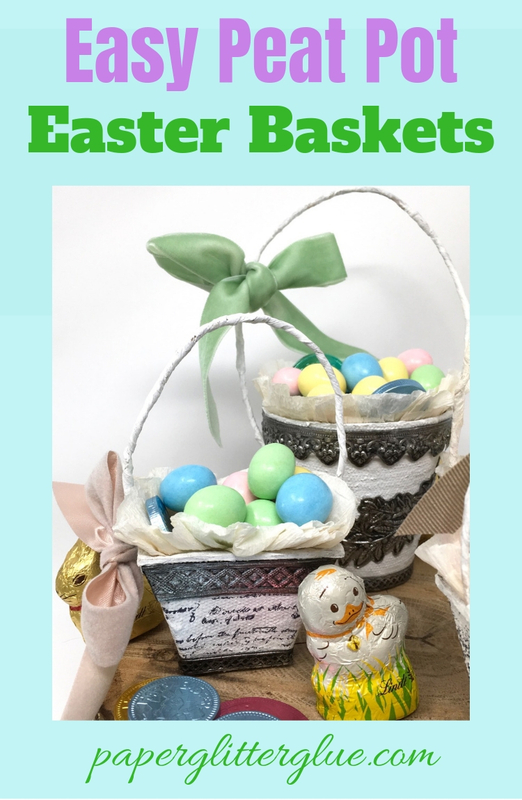 If you are looking for great Easter graphics to glue to the outside of your Easter basket, the Graphics Fairy has a ton of free downloads that you can use. Also you can purchase some wonderful sheets of graphics from Alpha Stamps. This is a good time to add the handle to your basket. I found it is a little easier to add it before all the adornments are added. First make the handle. Again you have lots of options here. You can buy a coated floral stem wire. And you can cover the wire with ribbon like you see in the Valentine basket below. 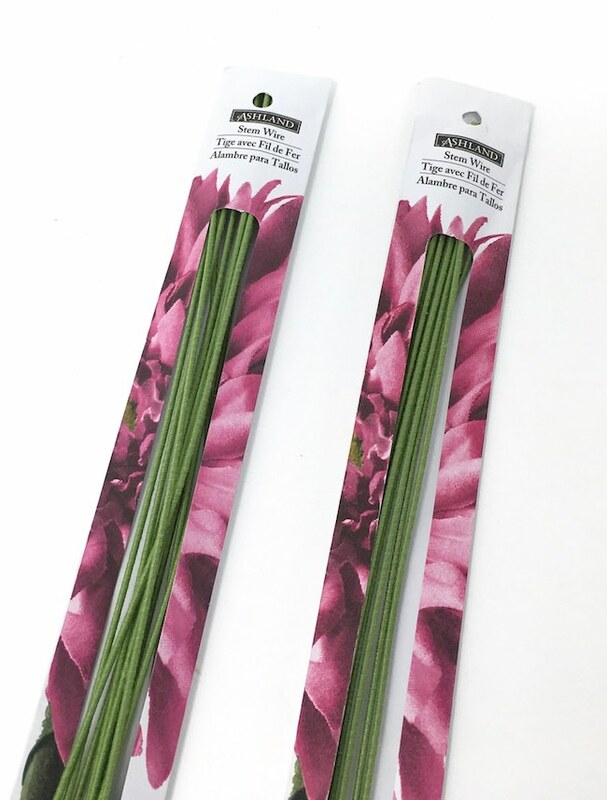 Ribbon wrapped around floral stem wire for Valentine basket. Or you could cover plain floral wire with paper. Of course, I chose paper. It’s just my favorite craft material. 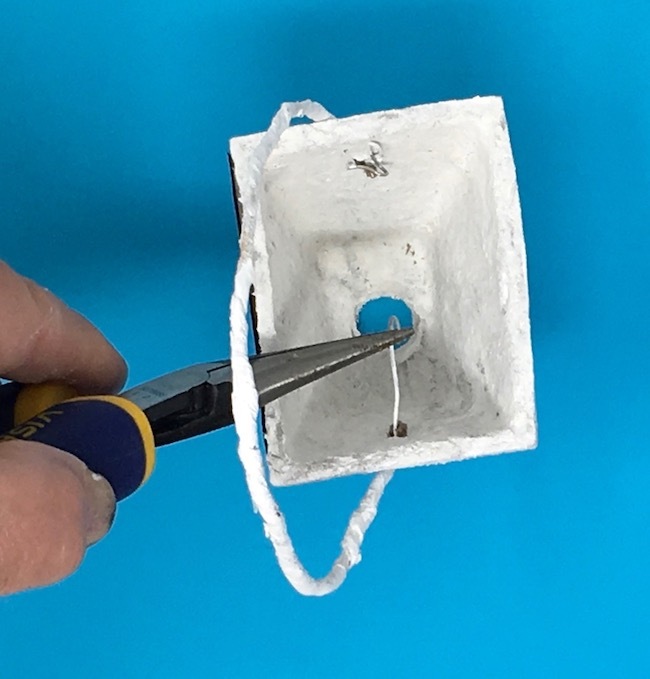 On each side of your wire cover all but the last 1-1.5 inches of the wire handle with paper. Leave that last little bit bare so it’s easy to push through the hole in the side of the peat pot. Probably the stem wire would have looked better, but it didn’t make my neutral color scheme. Next poke a hole on opposite sides of the peat pot. The peat pot material is very soft so it is easy to poke a hole through it. Thread the uncoated wire through the hole. 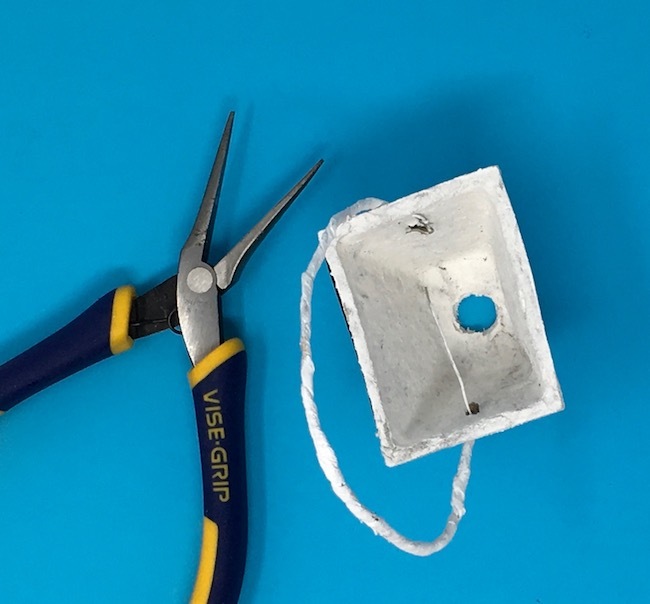 Grab the wire with your needlenose pliers and twist. Curl the uncoated end of the wire into a circle. That will keep the wire from coming out. Here is an example of the wire handle through the peat pot. I covered this wire later with paper. The nice thing about the Sizzix Impresslit trims is how nicely they fit on these peat pots. For the round basket, it takes two to go around on the top and 1 1/2 to go around the bottom. For the rectangular peat pot Easter basket it takes just over one strip to cover the top and one set of trims fits easily on the bottom. I cut each side separately for the rectangular basket because of the angled sides. And I used my favorite Aleene’s Fast Grab tacky glue to hold the trim on. 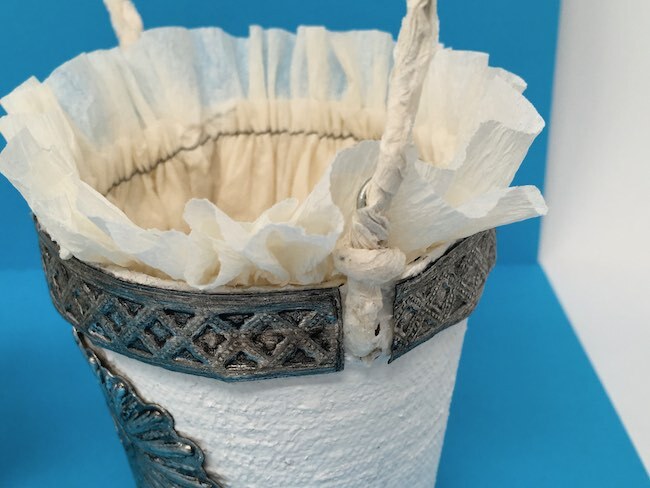 To adhere the crepe paper, apply a thick bead of glue along the edge and then firmly apply your trim working your way around the inside of the basket. Adjust the trim so the gathering is evenly applied along the edge. Then trim off the excess crepe paper trim. For the final touch fill your Peat Pot Easter Basket with candy or treats! There is a hole in the bottom of the peat pots that needs to be covered up if you didn’t already glue a bottom piece on. Now add small pieces of candy, miniature eggs or little treats to your delightful mini Peat Pot Easter Baskets. Tie a ribbon around the handle if you like. 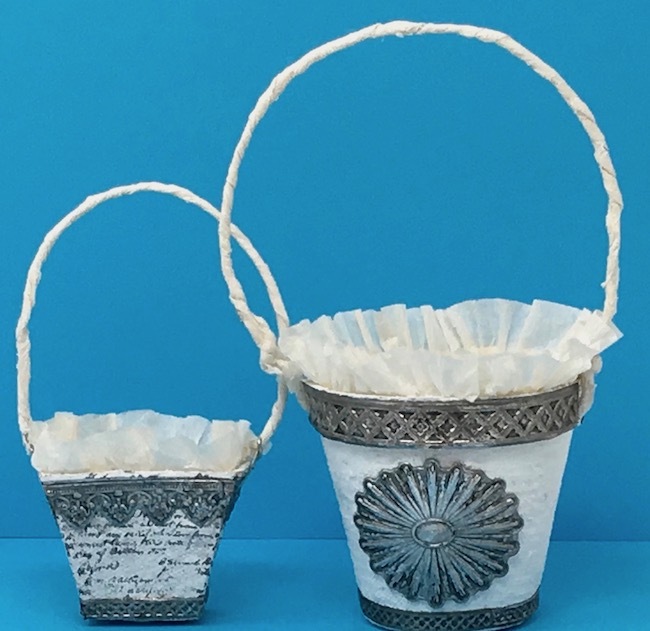 Just think of all the ways you could use these little baskets – for a surprise on a Christmas tree, party favors, teacher thank you gifts and so on. 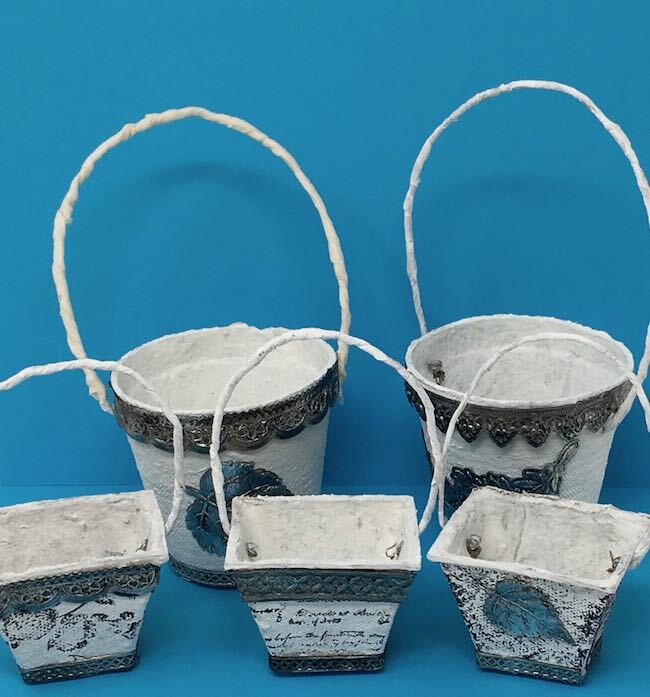 So I hope you will try making one of these easy peat pot mini baskets. Just love your baskets. They look like fun. Thanks for sharing and many thanks for joining us at A Vintage Journey. Thank you, Sandy. I love the Vintage Journey challenges.